Tijuana Mayor Juan Manuel Gastelum said Thursday that caravan migrants arriving by the hundreds are no longer welcome, an increasingly common sentiment among residents of the Mexican border city. Gastelum described the caravan of Central American migrants as a “horde” that has been infiltrated by criminals who now threaten the community, in an interview with Milenio Television. Gastelum called on the Mexican government to deport the caravan migrants as soon as possible. The mayor’s comments reflected anger among many Tijuana residents at the increasing number of caravan migrants who have been streaming into the city since last weekend. About 3,000 were there as of Thursday night, and thousands more are expected to arrive over the coming weeks. Hundreds of Tijuana residents protested Wednesday evening at a park just south of the border fence, where many of the migrants have set up camp. Some of the protesters shouted anti-immigrant slogans and tossed rocks at the migrants, even as police looked on. The 4,000-strong caravan, a mix of families seeking asylum and economic migrants, continues to arrive in Tijuana after a journey of more than 2,500 miles from Honduras to the U.S.-Mexico border. Caravan organizers could have chosen a much shorter route to the border near the southern tip of Texas, but opted for Tijuana in part because the city had already hosted a similar group in April. But the arrival of another caravan has frustrated local officials and residents who worry that the massive group of homeless Central Americans will be stuck in Tijuana indefinitely. U.S. border authorities are processing about 90 asylum seekers per day at the ports of entry near Tijuana, where there was a wait list of more than 3,000 people even before the caravan arrived. “We’re talking about a minimum of six months, and there’s no upper limit,” Gastelum said. 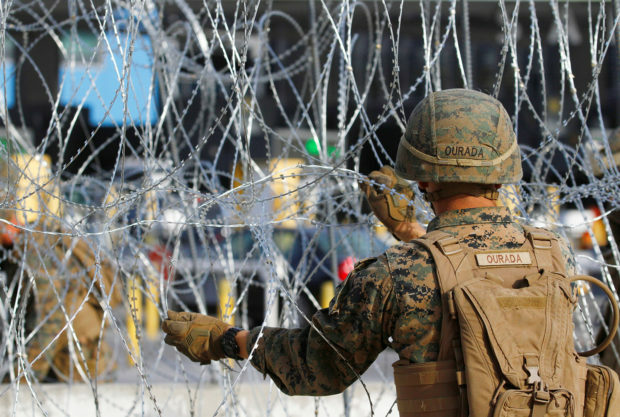 Trump’s order, which is aimed at channeling asylum seekers to the ports of entry, comes as thousands more Central American migrants have assembled in caravans headed for the southwest border. There are currently about 8,000 migrants crossing the country in several caravans, according to the Mexican interior ministry, in addition to the thousands that arrive at the border in small groups or as individuals on a weekly basis.